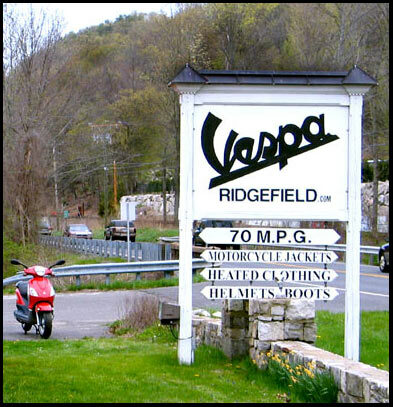 The BOT Team has enjoyed the best of times with Alex and the Vespa family in Ridgefield, Connecticut. There was the Mort Walker original cartoon art giveaway, the "Meet Mort Walker, creator of Beetle Bailey" at the 2007 Holiday launch of "Toys for Tots" . . . with the Beetle Bailey Balloon and artist Neal Walker, one of Mort's very talented sons (sculptor, comic art, animation) plus the 2008 Spring Open House with Alex's fabulous homemade chili under the big tent. Since its debut in 1946, the Vespa has been immortalized in film, art, posters, literature, song, advertising, and the front row at international events around the world. The biggest sales promo was and still is Hollywood and the movies . . . and the love affair continues. In 1952, Audrey Hepburn side-saddled Gregory Peck's Vespa in the film "Roman Holiday" for a ride through Rome, resulting in over 100,000 sales. Here is the wonderful Vespa scene in "Roman Holiday". . . The Vespa story begins at the end of World War II in a bombed out, war-ravaged, Italy of 1945/46. On returning home from the battlefields, the people found no jobs, and very little hope of finding employment in a country so devastated by war. The Piaggio company had produced airplanes and other forms of transportation during the war, but it was all in ruins. The two owners, brothers Enrico and Armando Piaggio had to find a way to save their company, or watch it become another casualty of the WWII. They decided the best way to go would be to build a new form of transportation. A form that would be fast, simple, easy on gas, and affordable. They considered motorcycles, but when they looked around and saw that what they had left to build with was mostly airplane parts . . .
Wednesday to Saturday 10 a.m. to 6 p.m.
on opening hours for exhibitions /events.